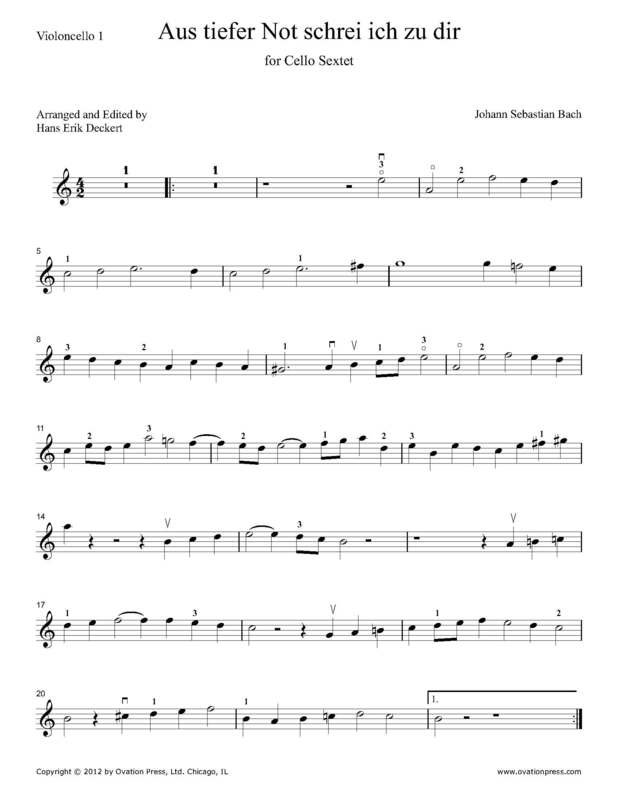 Johann Sebastian Bach’s 200 chorales are a testament to this composer’s greatness. The power of his music is undiminished after more than 300 years. Nothing sounds more natural than performing these chorales with a cello ensemble. The cello, with its warm tonal quality and more than 4 octave range has the ability to directly take over the choir's four voices: soprano, alto, tenor and bass. These arrangements for cello ensemble are written with exactly the same pitches as the choir’s original voices. The Chorale Aus Tiefer Not ruf ich zu dir, BWV 38, is available in arrangements for cello quintet and cello sextet. The latter is a masterful choral adaptation in the style of Bach’s organ works. Here Bach's polyphony unfolds with overwhelming beauty.